Learn the keys to creating a financially free state of mind and life! The first 25 people to register receive a complimentary gift. 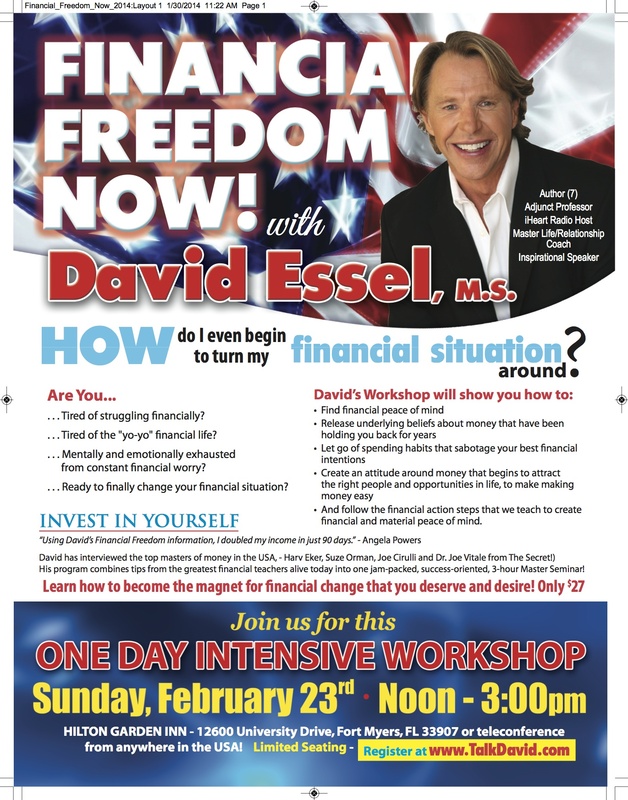 Nationally recognized motivational speaker and author, David Essel, M.S., is pleased to announce “Financial Freedom Now!” a one-day intensive motivational event to be held on Sunday, February 23, 2014, from noon to 3 p.m., at Hilton Garden Inn located at 12600 University Drive in Fort Myers. This one-day intensive motivational event, “Financial Freedom Now!” is being offered at the low price of just $27 per person. This motivational program is offered across the country for $399 per person. The first 25 people who register and pay online prior to February 14th will receive a complimentary autographed motivational DVD, The Power of Transformational Thinking, valued at $95. “You can create the financial success you strive for and break through the threshold,” says David Essel, M.S. “With this intensive one day workshop you can unlock what is holding you back from all that you desire. Many clients have doubled their income regardless of what the economy is doing or where they live.” The workshop is available in person or via teleconference from anywhere in the United States. Participants will learn the keys to creating a financially free state of mind and life. For the past 23 years, David has interviewed the top masters of money in the USA, (best selling authors like Harv Eker, Suze Orman, Joe Cirulli and Dr. Joe Vitale from The Secret! ), and has now created a program that combines tips from the greatest financial teachers alive today into one jam-packed, success-oriented, 3-hour Master Seminar! “David helped me get off the couch, get confident and FOCUS on the things that mattered versus all of the things that don’t. Since then, I’ve quadrupled my salary in the aerospace business, written two books, contributed to two others, launched a speaking and consulting business and built a musical cover band that plays all over North America,” Lee Witt, former participant. Participants will walk away knowing the beliefs, both conscious and subconscious, about money that they carry today that need to be released, and also how to become the magnet for financial change that they deserve and desire! They will also learn how to create daily financial rituals, powerful action steps, which will lead to both mental and physical financial freedom. It’s possible to NEVER worry about money again. David will show everyone exactly how to do this and create a path to success that is guaranteed to work for life in 30 days or less! “When I first worked with David back in 2006, my friends told me I was crazy to hire a coach. It was a big investment in myself and I did hesitate, but finally decided to take the chance. That investment has come back to me so many times over and in every way possible… financially, spiritually, mentally and physically. As a direct result of our work, I doubled my income in just 90 days,” shares Angela Powers. Seats are limited. For more information or to register, please call 239-433-9111, email talkdavid@aol.com, or visit talkdavid.com. The first 25 people who register and pay online prior to February 14th will receive a complimentary autographed motivational DVD, The Power of Transformational Thinking, valued at $95. “David Essel’s destiny in life is to help you feel more alive in every area of your life,” shares Wayne Dyer, Ph.D., internationally renowned author and speaker in the field of self-development. David Essel, M.S. is an Author, National Radio and Television Host, Master Life, Business and Relationship Coach, Adjunct Professor, All Faiths Minister, Addiction Recovery Coach and International Speaker. His mission is to inspire others to reach their own exceptional potential in their business and personal life. His purely positive national radio show of 23 years, “David Essel Alive!,” is heard on iHeart Radio every Saturday from 6-9pm EST. David’s professional presentations on how to lead a passionate and inspiring life have drawn rave reviews from corporations such as Chico’s, Nestlé, and Boeing, media outlets such as FOX and Premiere/Clear Channel Radio, as well as non-profit organizations like the March of Dimes and Unity Church. David Essel offers coaching and group sessions via phone to anywhere in the world. For more information call (941) 266-7676 or visit davidessel.com.